Avalon Theisen, 14, of Florida was honored with the Gloria Barron Prize for Young Heroes for her conservation work. 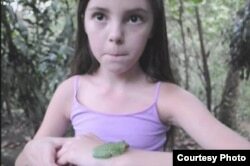 In April, Avalon Theisen, 11, organized Tampa, Florida’s "Save the Frogs Day" event. “This year we created something that I don’t think had ever been done before," Avalon says. "We videoed 347 people and one happy dog and created Florida’s largest human frog chorus to raise awareness for amphibian conservation." That would be humans making frog-like noises. Through her website, and Conserve It Forward, the non-profit she founded two years ago, Theisen raises money for conservation, inspires other kids to take care of the natural world and shares her passion for protecting frogs. Avalon Theisen, 14, organized Tampa, Florida’s "Save the Frogs Day" event. Theisen's efforts were recognized this year. She is being honored with the Gloria Barron Prize for Young Heroes. The annual award, established by children’s book author T. A. Barron, honors young leaders, between eight and 18 years old, who are making a difference in the world. That’s why Barron started the prize 12 years ago. The winners receive $2500 to support their education or service project. Honorees have to meet certain criteria, according to Barron. That includes a genuine sense of passion about a problem that affects humanity or the environment; a real and lasting commitment to try to make a difference; and effectiveness, measurable results of a project that has actually made a difference. The prize is named for Barron’s mother. Like Barron's mother, this year’s honorees have made a difference in a wide range of areas. Barron notes that, although the Young Heroes have different interests and backgrounds, they all possess self-confidence. “The one thing that's really in common is a sense of themselves as a bundle of energy that could be turned toward positive good and help other people” he says. And, he adds, they have family support, parents who encourage them to turn their dreams into action, and to realize they really can change the world. Correction: An earlier version of this story incorrectly reported that Avalon Theisen was 14 years old. VOA regrets the error.